While many homes are divided on the gas versus electric debate, most home chef enthusiasts prefer gas, both for its fine temperature controls as well as the aesthetics. 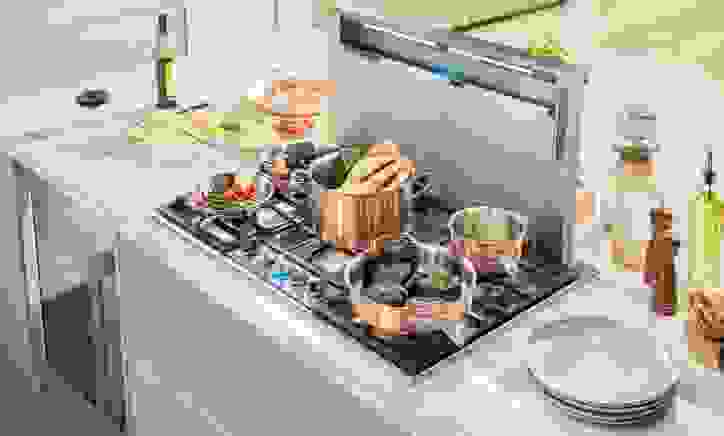 It should come as no surprise that the Thermador SGSX365TS gas cooktop (available at AppliancesConnection for $1,999.00) delivers on both. It's the successor to the Thermador SGSX365FS, an old favorite of ours. And while some elements have changed, this cooktop is proof that Thermador still knows how to make a great cooktop. The clean lines and signature star burners on this cooktop give it a streamlined look that will definitely draw the eye of the design-minded guests in your life. It has five gas burners, two of which have the option for "extra low" simmering, as well as a central power burner, which maxes out at 16,000 BTU. We also love that a blue ring lights up around the knobs when they're being used. 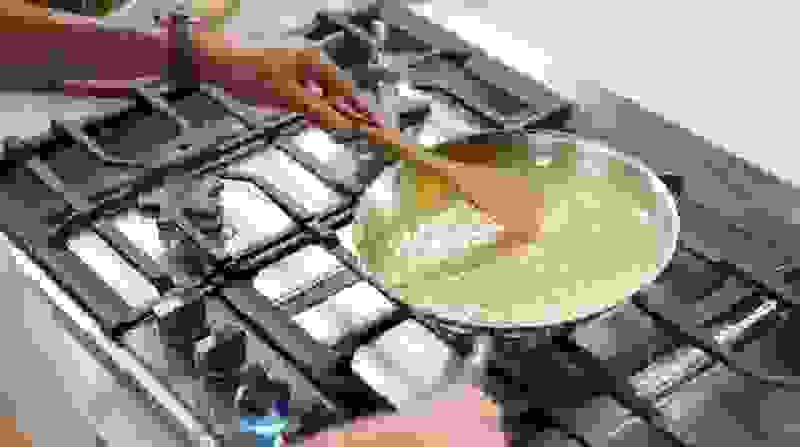 This 36-inch gas cooktop is big enough to comfortably fit many large pots and pans at the same time, so you won't need to worry when those dinner parties or big holidays come around. It also comes with electronic reignition that automatically reignites the gas flame if it goes out for any reason. The Thermador SGSX365TS gas cooktop is spacious and can easily accommodate multiple pots and pans at the same time. The center burner can boil 6 cups of water in about five-and-a-half minutes, which is none too shabby. For the other cooktops we've tested, it takes an average of about six minutes to boil 6 cups of water. All five burners can reach temperatures above 450°F. The hottest recorded temperature was on the center burner, which maxed out at 517°F. Other than the center and front-left burners, which have the "extra low" simmer setting, the best burner to maintain a low temperature is the rear-left burner, which hits 136°F at its lowest setting. The burners and grills are spaced far enough apart that it won't be difficult for you to fit a sauce pan and a spaghetti pot next to one another. While most burners have natural hot spots in the center where the gas is most concentrated, this model's star-shaped burner covers tend to block more of the flame from being delivered directly under the pot, resulting in a rarely seen cold spot in the center. Even still, the temperature differentiation is less pronounced than hot spots we've tested on other gas cooktops. The signature star-shaped burner covers, while adding a bit of visual interest, are notoriously harder to clean compared to their circular counterparts on other gas cooktops. The center burner on the Thermador SGSX365TS gas cooktop has 16,000 BTUs, as well as an "extra low" simmer setting. On the center 16,000 BTU power burner, it took about five-and-a-half minutes to boil 6 cups of water. While that's not as fast as the boil time on induction cooktops, which can boil 6 cups of water in as little as two-and-a-half-minutes, it's comparable to the boil times of other gas cooktops. The front-left, center, and rear-right burners all reach maximum burner temperatures that surpass 500°F. This is pretty good for a gas cooktop; on average, the maximum temperature range tends to fall somewhere in the 400°F-450°F range. The burner that gets the lowest in temperature is the rear-left burner, which comes in at a relatively chill 136°F. However, the other burners have a tough time getting lower than 150°F, so it's helpful that this cooktop has the two "extra low" simmer settings on the center and front-left burners. Use those burners if you need to keep a sauce simmering without scorching. During our testing, we discovered that the "extra low" simmer burners actually cause the gas flame to cycle on and off to maintains those "extra low" temperatures. If you see the flame go on and off repeatedly while the burners are on this setting, know that it's a feature, not a bug. Thermador offers a two-year warranty on the SGSX365TS that covers parts and labor, as well as a cosmetic warranty for the first 60 days that includes scratches, chips, or dents in the stainless steel finish. This is a brand new cooktop with almost no existing reviews. However, this unit is replacing the SGSX365FS, which was one of our top gas cooktops. The SGSX365FS seems to be rather polarizing; some users love it and find it easy to clean and maintain the burners and the stainless steel finish, while others find that the star-shaped burners are difficult to clean and that the "extra low" simmer burners make very loud clicking noises every time they cycle on and off. 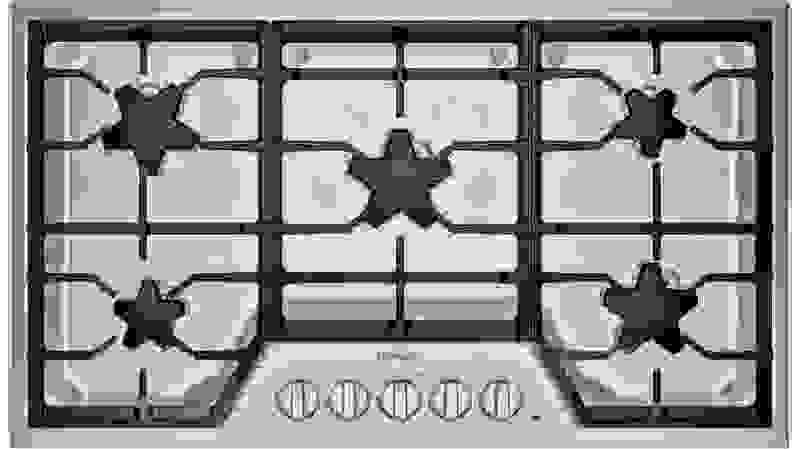 Since the SGSX365TS has the same star-shaped burners, users may have the same love/hate relationship with them, even if the cooktop performs well otherwise. If you're just looking for a basic cooktop, then the Thermador SGSX365TS might be out of your price range; excluding induction, electric cooktops are typically a bit cheaper than their gas counterparts. If, however, you're looking for a high-end cooktop that has both form and function, then the Thermador SGSX365TS is a worthy contender.